All the black cards Wu Dao Zi discards are considered Ink. All the red cards Wu Dao Zi discards are considered Color. Wu Dao Zi can discard an Ink and a Color to cause one unit of either fire or lightning damage. When Wu Dao Zi uses "Painting", he must use both an Ink and a Color. He then gets to chose the alignment of the damage. 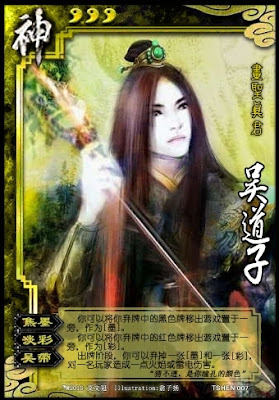 Wu Dao Zi can use "Painting" as often as he likes during his turn.